Allison is, 364 days a year, completely good with being single. Her mother’s Christmas party is the one exception. Troy has no interest in a relationship, until he meets Allison. 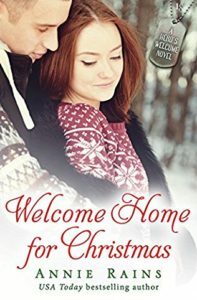 Mix in a charity bachelor auction, a quick agreement to be a fake boyfriend, volunteering with orphans, and a few meddling family members, and Welcome Home for Christmas is a delightful holiday read about second-chances and true love. Below is an excerpt to help you get a feel for the book. I really would recommend this as a sweet holiday read, about family and redemption and finding your true self. There’s some adorable moppets as well, and it all moves very quickly. Easily a weekend read, preferably with a fire lit and hot chocolate in hand. Toys for Tots is a great organization that ensures kids have treasures under the tree this holiday season. It’s from a few years ago, but still a good list – Publisher’s Weekly rounds up 10 of their favorite holiday romances. I received a copy of this delightful book in exchange for participating in this blog tour from Tasty Tours. Thanks!